Patrick Keller’s presentation from Troy Taylor’s American Hauntings Fall Festival, Becoming a Paranerd: A Brief Tour Through My Paranormal World. Plus 15 Reasons to Befriend a Paranormal Nerd Today! 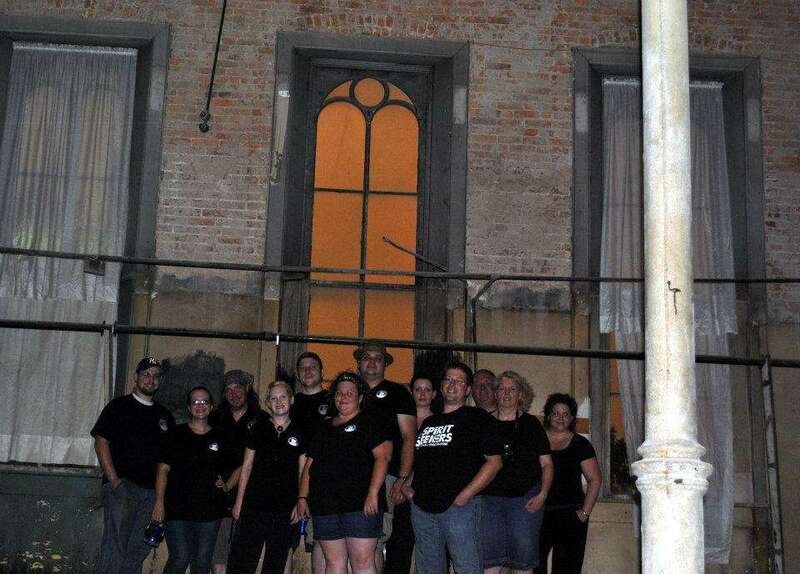 In the past, I’ve been lucky enough to join two other paranormal teams, JPRS and JHPS, on two different investigations. 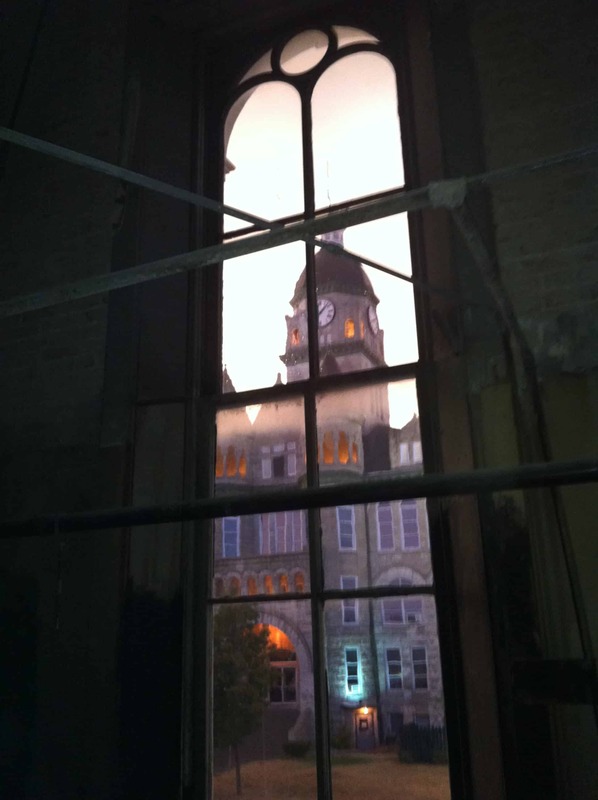 In both the Fort Chaffee Prison investigation and the Carthage Opera House investigation, I learned so much from everyone I investigated with. They were really great experiences, and I gained some good friends! In honor of me being so excited about an upcoming January investigation with this same group of amazing investigators, I thought I’d share some fun shots from the previous two investigations. More to come, I’m sure. Hey paranerds! I haven’t done any experimenting with EVP, or any spirit communication for that matter, in a few months. That may disappoint some of you, but I have to be honest. Life gets going and then sometimes you like the idea of having a bit of true free/lazy time when you can get it… and it’s also possible that I was a little burned out with evidence review and analysis. It is now officially summer for me and lazy is exactly what I’ve been for a week and a half, but I’ve enjoyed every snore of it. In the next few weeks I’m likely to be out of town once or twice for several days at a time, but I do plan on getting started on some more Ouija/EVP/Spirit Box sessions soon, and I hope to be able to share results with you. I’m also excited to be jumping into several new books. Since most of you tend to be more interested in the “spirit communication” posts, I think that maybe it’s time I shared just a few EVP with you. These will all be from MOSS’s Papa Jack’s Pizza investigation from January. 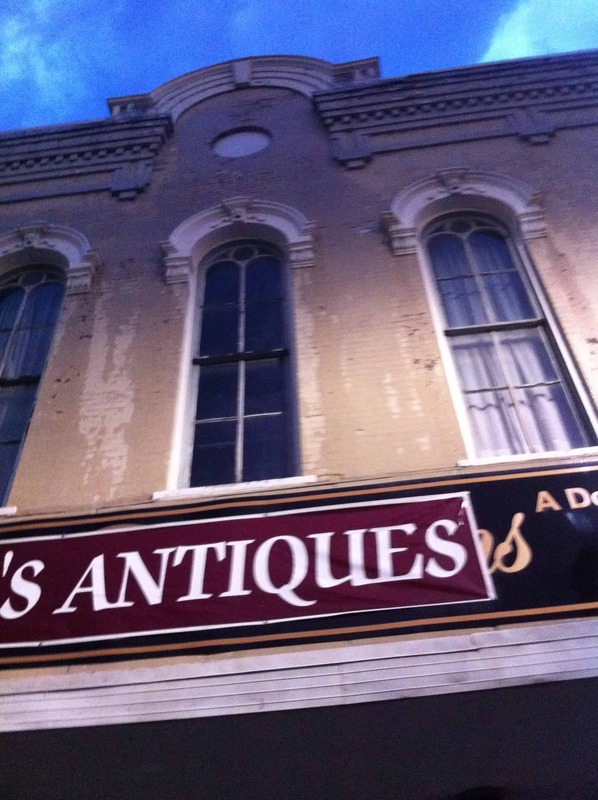 Anyone interested in viewing and hearing all artifacts from that investigation should visit a previous post entitled Papa Jack’s Pizza: Final Investigation Report. This first artifact is one that our friend and EVP researcher, Randall Keller, has already given me feedback on. He’s excellent at digging into them and really cleaning them up. I’ll let him determine if he’d like to share that here. I personally don’t hear it clearly enough to take a stab at what is being said. What do you think? 11:58pm – While we’re in the back room behind the restaurant kitchen on the main level, from the PX-720 on the 2nd floor landing there appears to be a voice that responds when I ask the question “Is this not a place you like to be?” You can also hear a short snippet of the same noise or voice a few seconds later as I’m talking (which is hard to enhance or single out). Comparing this to the audio that was with us in that room, I can’t hear those noises or anything that would have created them. From the NightShot video I can’t tell either. This seems like a good EVP catch! The next artifact was captured from the 2nd floor landing where we had a stationary digital audio recorder planted for a majority of the investigation. At this point in time, other than Linda who was at command central a floor below (and on the opposite side of the building), all other investigators were in the basement (two floors below). As you can see, in the final report I indicated that this was a “distant and very soft voice or shout” and “possibly someone outside.” I’ve since decided that this isn’t a shout, making it unlikely that it would have come from outside. If you listen several times very carefully, it sounds more to me like a short melody being sung or hummed. Enhancing this moment in the audio didn’t help to bring out the voice. It is important to note that whistling and singing are just a few of the claims of activity reported at Papa Jack’s Pizza. We did capture evidence of what sounds like whistling, and in those cases they were usually 2 or 3 short pitches, similar to below. 12:12am – From the 2nd floor landing, a distant and very soft voice or shout was picked up in the PX-720. Possibly someone outside. The last artifact came from the spirit box during an investigation of the basement. I go back and forth with whether I’m hearing “messages to us” or not, and I’m not exactly sure how early the communication starts. There are several interesting sputters before “messages to us”. 12:27am – Toward the end of the sweep cycle that begins at 4:25:30 in PX-820 Track 1, in the audio I hear something that ends with “messages to us”. After analysis I no longer hear “messages to us”, but there seems to be a phrase there… just not sure what it is. How Does the Skeptic View Paranormal Folk? I’m going to go ahead and safely assume that the vast majority of readers or even one time visitors to this blog are somehow interested in or involved in paranormal or spiritual topics (unless they landed here on accident while trying to search for something cool like a Snuggie for their dog, although those people tend to be paranormal folk too… I think.) So it is this group that I would like to direct this post to. But I want to make it clear, skeptics and Snuggie people are welcome to read and respectfully comment as well. There are several things that I have not been shy about discussing since I started Big Séance. One of them is that several years ago I began experiencing what I’ve called a “spiritual shift”. That’s the spiritual side of me. At about this same time I started to be fascinated with the paranormal, specifically ghosts and spirit communication. That’s the paranormal side of me. Sometimes I have a hard time bouncing back and forth between the two, fitting into discussions or conversations online, etc. But the one thing that makes me the awkward guest at both parties is the fact that I’m often the more skeptical (a naughty word in both parties) person there. Obviously that doesn’t mean I am out to prove the paranormal doesn’t exist. I’m convinced life doesn’t end at death. I know that sometimes spirits don’t move on and stay with us, and perhaps visit us on occasion. No one needs to tell me one way or the other. But I do think that there are many in the paranormal field whose behavior and reckless claims about things make us look a little… hmm… childish. Inexperienced. Dumb. There always seems to be that Class A EVP that CLEARLY says “Hey thanks for stopping by but I want you to GET OUT!” even though I hear a cough and 4 investigator footsteps. There’s the orb that has 50 possible natural explanations, yet someone decide’s it’s the ghost of Matilda because look, you can see two eyes a nose and a mouth. I try my best to not criticize the theories and beliefs of others, and feel like often I examine and take a hard look at my own. I don’t go out there trying to pick fights. I just think that as investigators or “ghost hunters” (ugh), we need to be as honest and responsible with what we’re saying and what we’re putting out there. I know I’m not a scientist or parapsychologist, or an expert in either of these fields, but I have bravely referred to myself as a “researcher” who seriously studies and works with the paranormal… and even though there is a lot I still don’t understand, up to now I’ve felt good about that. Perhaps that’s silly. I follow and learn from smart people, many who truly are deserving of the “expert” or “researcher” title. I realize that people who know me in the real world probably get a kick out of this time-consuming and expensive hobby when they find out how I spend my time when I’m not at the day job. Perhaps some of them snicker when they see my posts, and maybe decide that it’s a shame that I’ve gone off the deep end. But honestly, most of the time I don’t even worry about what people think, because I get so excited about it! I plan my blog posts out in my head at work sometimes and can’t wait to come home to get them started. When an investigation is in the works or when someone asks for help, I put all of my effort into that. I get really excited to jump into my next non-fiction book. I want to learn… I want to discover… and I want to share. Anyway… So I find this skeptic and her blog and I think… “Hey, I like to be skeptical. I want to be balanced and see what I can learn from this.” Sharon Hill, the skeptic, is also a geologist. According to her bio at The Huffington Post, where she is a contributor, she “is a researcher specializing in the interaction between science, the media and the public. She is an advocate for scientific skepticism and the editor of DoubtfulNews.com — a critical thinking weird news blog.” Sharon is also the author of another blog, Doubtful (idoubtit.wordpress.com) which I now bravely follow, that caught my attention and is the reason you’re hearing from me today. Promise me that even if you stop reading now you’ll watch this 35 minute video that was shared in her latest blog post. It is your homework. This is her speaking at the Northeast Conference on Science and Skepticism (NECSS), in which she discusses her examination of paranormal groups and paranormal people, our beliefs, practices, equipment, our black t-shirts, our self published books with no references or citations, and our “sciencey” words because we want to sound professional and serious. It will open your eyes and mind to what we as paranormal folk look and sound like to the skeptic. I’m not going to lie… I was scared to death and worried that she was going to pull up a screenshot of my paranormal group’s outdated website… or even this blog. I found myself agreeing with her at times. She hit paranormal TV pretty hard. But I’ll admit I was hurt (didn’t shed any tears) because in parts of her talk I saw and heard myself in a lot of what she was saying. I’ve watched a few videos and I’ve heard her in an interview, and I really do think she is making an effort to understand us. She seems to be respectful about her opinions, even though she’s clearly relaxed and in front of her own crowd in this video. But still… I’m a bit bothered by it all. She feels that most of us “value science” but we “don’t have a clue how it works.” At one point she talks about how we tend to want to help, and we’re serious, we just don’t know how to do it. We’re simple folk who are just “invested emotionally” in our beliefs. Here are several questions that popped in my head during the two times I watched this video. Am I just so “invested emotionally” in my beliefs about the paranormal that my eyes are closed to anything else? Am I “fooling the public”? Are her views and opinions a reflection of the average scientist? Am I seen as dumb or ignorant? Should I even care about science? Do we have to have their approval? Does my involvement in the paranormal have any worth at all? The video from her latest Doubtful blog post. If you’ve made it through this incredibly bi-polar and emotionally invested post, please share your thoughts. I know you want to! Share away before I wake up tomorrow and decide to delete the whole thing! Ghost Adventures & Weird or What? My dad called me about this one. “Hey! Turn it on SyFy. There’s a new show and they’re talking about séances!” This seems to be a goofy show that tastes a little like Unsolved Mysteries to me. Maybe it’s the reenactments that give me that vibe, because it’s certainly not the goofiness. And that’s not horrible, I guess… because I love me some old school Unsolved Mysteries. To this day the old theme song can make me pull the covers over my head, but musically I just love it! But Weird or What? is hosted by William Shatner (which explains the goofiness). William Shatner hosting Weird or What? The particular episode that I watched was episode #2 and titled “Life After Death”. In this episode, Mr. Shatner makes his entrance on a Segway…. ??? I was delighted to see that the séance material ended up being about the Scole Experiment, which I’ve discussed on this blog quite a bit (see related links below). Most of the information was watered down to fit a small segment, but it was nice to see some fresh discussion on the topic with people involved. Other segments include a man who has been told and is convinced that in a past life he was a general in the Civil War Battle of Antietam, and a man who comes back from the dead after 18 years. That last one, of course, is trying to take advantage of the huge zombie craze that the American culture is going through right now. Some of the interviews in this episode include a scientist who discusses his theory about the soul and quantum physics (that’s when I started seeing chickens out of the corner of my eye and thought about going downstairs for a snack), a photography expert that analyzes some of the Scole evidence (even though it has already been done), and a Harvard psychologist and a scientist who both play the part of skeptics. The scientist sets up an almost insulting and fake séance for unsuspecting sitters. Of course, this is his way of saying it’s all an illusion. So what did I think? It’s the only episode I’ve watched and my DVR is not set to record anymore episodes. I used to not like the boys from Ghost Adventures at all. In fact (as if I knew it all), I would roll my eyes and tell you all about why I thought they were giant asses (though they have been in the past). I’ve talked to other GA fans who believe that they’re softening up a bit and getting more serious. That might be true, but I think I just didn’t really give them a chance before because of the first impression. I began really checking them out in preparation for my Fort Chaffee Prison investigation with JPRS. They had investigated that location a year or so before and I studied that episode. Some people turn their noses up and pretend that all paranormal television (Ghost Hunters, etc.) are nonsense and had nothing to do with why they do whatever it is they do in this field, but I’ve learned to appreciate them for what we can get out of them. I suppose there are pioneers out there who have been at it for years, but the vast majority of people in this field joined AFTER the great paranormal craze of the early 2000s. (Warning: Completely random comment. I think we need to start using the term “ott” or “ot” again when referring to the first ten years of the century. Thoughts?) I can’t pretend Ghost Hunters wasn’t one of the biggest inspirations for why I do what I do. Anyway… (Look! There goes another chicken!) I’ve been watching more Ghost Adventures episodes recently. The episode of their most recent visit to the Goldfield Hotel was outstanding, but just the other night I watched the Glen Tavern Inn episode. What fascinated me about this one? Not only did they get some really great EVP, and they gave us plenty of shots of the beauty of the hotel, but they conducted a séance! I was pleased to see Zak and the boys be open to doing that. 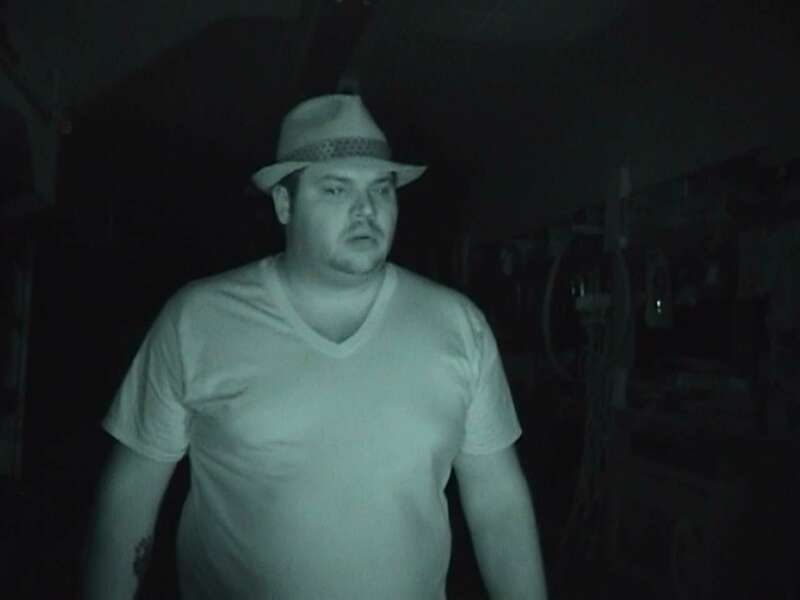 The fact that they (like Ghost Hunters) have been having celebrity guests lately has been getting on my nerves, but I guess they gotta do what they gotta do. Has anyone else been watching? I Still Watch Ghost Hunters… So What? I’m just as scared as you are. 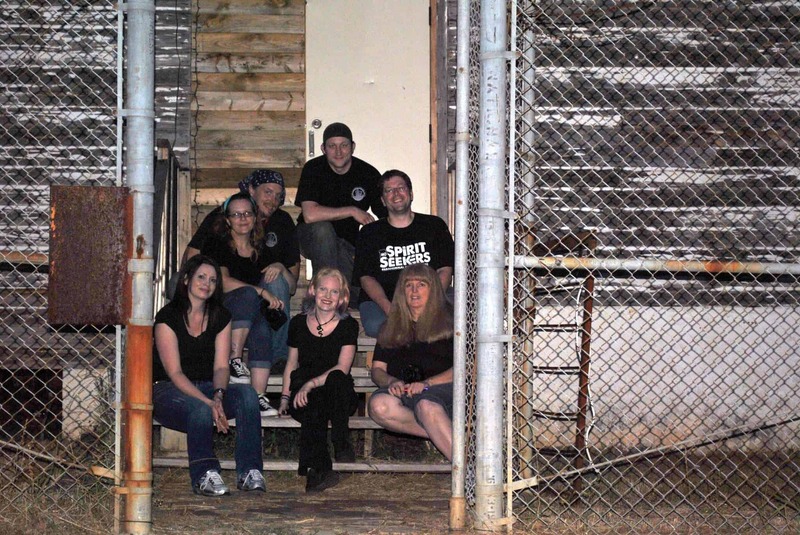 Our group photo from the investigation of Fort Chaffee Prison. I canNOT believe that it is possible for this to be my 200th post… but it IS! I’m not going to give a tear-filled Oscar speech or anything. I just want to thank you, my readers for making me feel like someone is there and interested in my blabbering. 🙂 Now I’ll move on to the actual post. 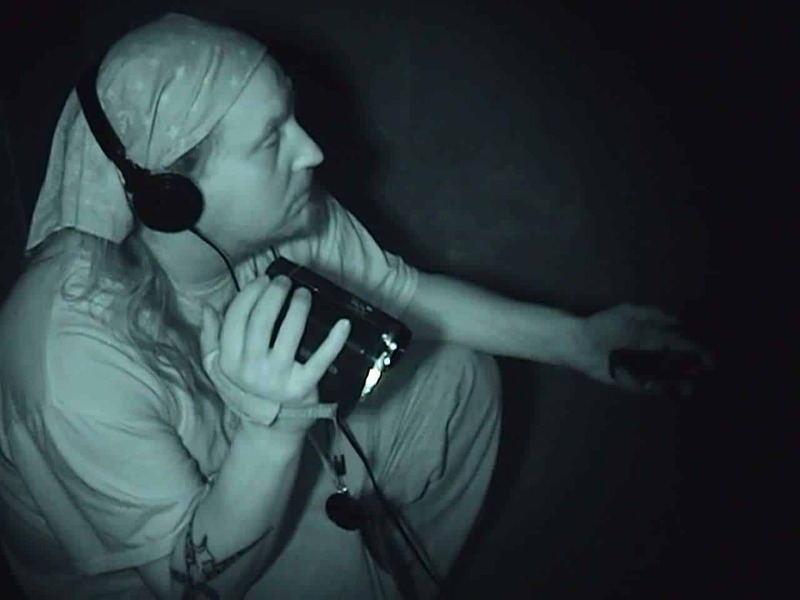 Dar, founder of Joplin Paranormal Research Society (JPRS) has put together several amazing videos from the two joint investigations that I have been lucky enough to be a part of. The first of these investigations was at Fort Chaffee Prison in Fort Smith, Arkansas. The video below is her most recent and highlights our spirit box session (Dar calls it a “Ghost Box” and we’ll still like her for that 🙂 ) from the latrine at the prison. Her video is a compilation of video and audio from several of our devices. Our visit to the latrine was actually a spur of the moment session at the end of our investigation that ended up giving us some of the more fascinating moments from the whole night. I wish we would have had the chance to spend more time there. 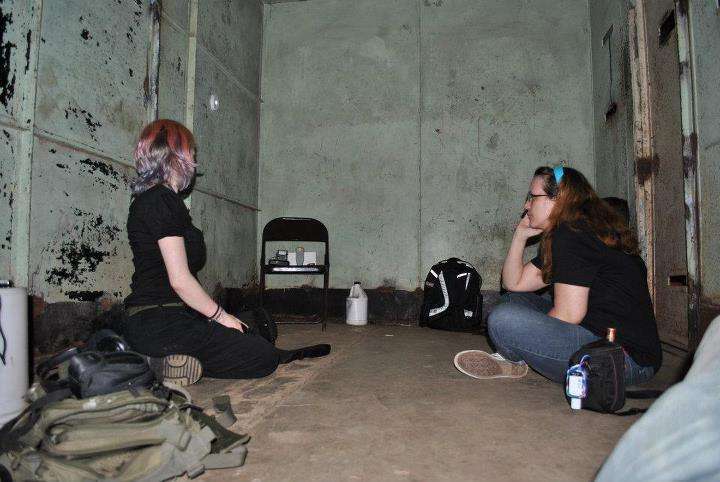 Dar during our spirit box session in the latrine of Fort Chaffee Prison. Dar was actually the first person to really introduce me to the spirit box (or radio sweep) and I’ve learned a lot from her. Since then I’ve researched it a bit, and I now have my own box that has been used on investigations and for experiments quite a bit. 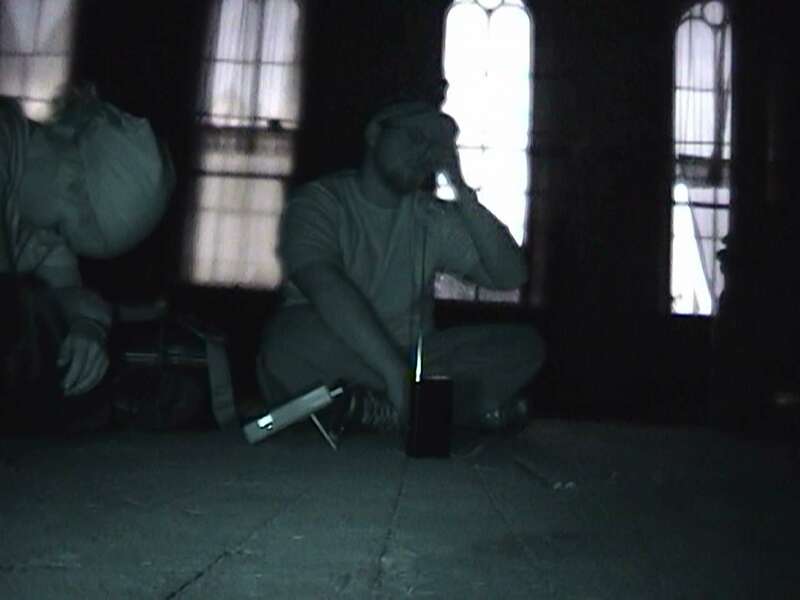 Unfortunately, I’ve not had the wealth of success with my spirit box that JPRS tends to get on their investigations. Though I think there is clearly something to this radio sweep stuff, my regular readers know that I am very cautious to claim any radio sweep responses are solid pieces of paranormal evidence. With that being said, it’s a regular and fascinating tool in my paranormal toolbox. Papa Jack’s Pizza resides in a building that was constructed in 1869 on historic Main Street in Lexington, Missouri. I’ve mentioned MOSS’s fascinating investigation of Papa Jack’s Pizza in Lexington, Missouri several times recently. It has taken months to complete the analysis and get to the point where I could present this report to you. For the first time ever, I’ve decided to publish the entire investigation report document for this investigation. I debated back and forth on whether or not this was a wise decision, but in the end I decided to just do it. When you click on the link below, it will open up the 27 page PDF file through Google Docs and will have all audio and video artifacts linked in the document. We’d like to thank Jamie and Kathy at Papa Jack’s for allowing us to have this opportunity. Do Spirits Reside at Papa Jack’s Pizza in Lexington, Missouri? I’ve been working very hard for months on a previous investigation from Papa Jack’s Pizza in Lexington, Missouri. Click HERE for more information about Papa Jack’s. The analysis is complete and I’ve put together a 27-page report with 83 audio and video artifacts for the owners. Very soon I’ll publish a summarized online version of this report with some of the evidence. Until then, below is a look at probably our strangest and most mysterious evidence from the investigation, directly from the report. We don’t have an explanation yet for what you’ll hear below. The owners don’t either. We’re open to suggestions, especially from Lexington residents who may be more familiar with the environment of the area. 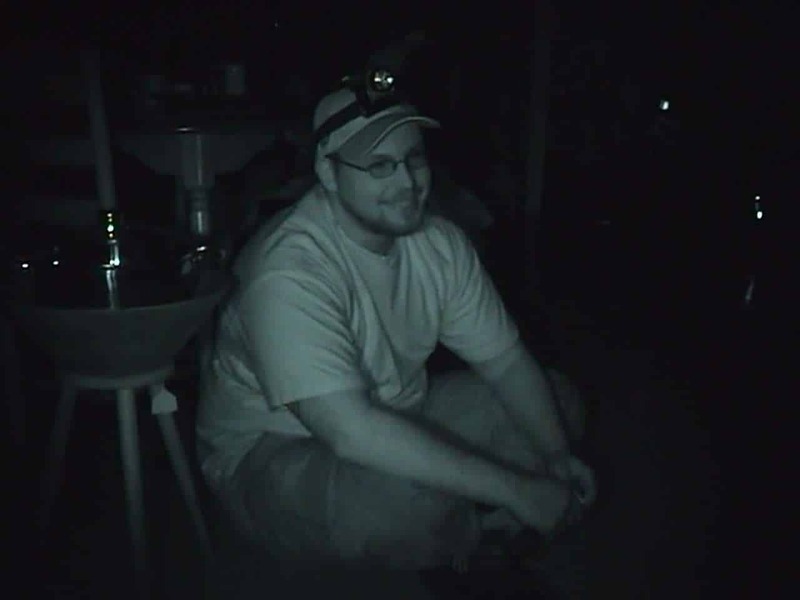 At around midnight we took our investigation to the basement, where there have been past reports of paranormal activity. These reports included hearing singing and whistling. 12:05am – As we were passing the stalls and stepping down from where it drops off (near the shower), Cassie heard 3 quick clicks or taps and asked if we heard it. It is picked up in the audio and the NightShot. It apparently stood out to Cassie, but it would be impossible to know if it was one of us or paranormal. Just seconds later is where we first heard what we’ve been referring to as repeating “moaning” sounds. It was picked up in the audio and NightShot with investigators. Norman did not hear it (which is funny because he was holding the digital audio recorder) and Cassie said later that she only heard a little of it. It seemed to come from the stairway to the basement or upstairs in that area. At the time, Bailey and I were in front of the wooden stalls near the spot where you have to step down to go the other half of the basement. We hadn’t stepped down yet. Norman had just walked in and out of one of the stalls and then joined Cassie near the shower, further into the basement (past where you step down). Linda also heard it from upstairs in the main level restaurant dining room at command central near the front entrance. Unfortunately, her digital audio recorder stopped a while before this experience, but she said it was pretty clear and loud. I noted that this was where the service person heard the singing (next to the generator). Also, it was NOT picked up in either the Tascam or the New Camcorder Video in the main level restaurant kitchen. I later described it as overlapping, almost like a siren. When it repeated it started at the same pitch and descended, but seemed to start again while still descending. We later made a request for whoever made the sound to do it again. No response. 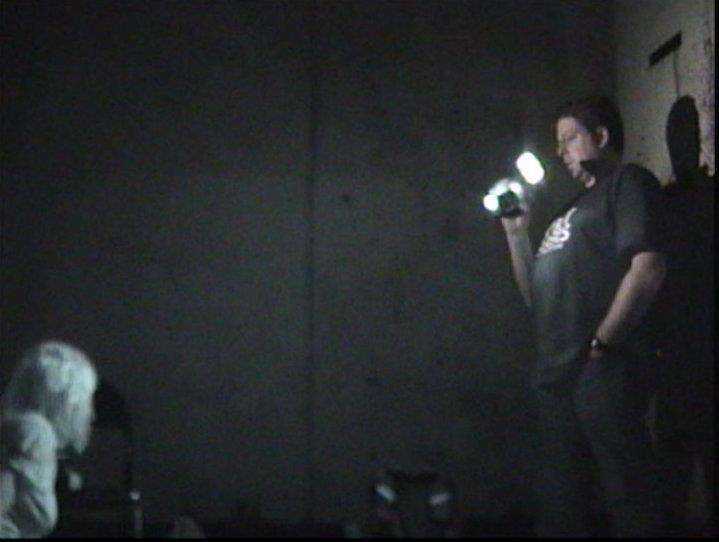 Toward the end of our investigation we decided to make another visit to the basement. It was almost an exact replay of events, although this time all investigators in the basement heard it, and those upstairs in the main level restaurant dining room did not. 3:11am – At this point we heard the “moaning” sound again. This time Bailey commented that “it sounds like a siren”. Norman mentioned that each time we’ve heard the moaning it was right after he came out of one of the stalls. I mentioned it didn’t sound so much like a voice to me this time. Bailey agreed. I also mentioned it sounded lower this time. It was captured on the audio and both videos, although of the videos, it is much clearer and lasts quite a bit longer in NightShotA. Later we learned that Cassie and Linda (both at Command Central this time around) did not hear it upstairs. 3:12am – While discussing it, I thought I heard it starting to come back again, but it was apparently so soft that the recorder didn’t pick it up. Neither did the NightShot videos. Norman walked into the stall again, attempted some communication, and then walked out to see if he could re-create the “moaning” sound once again. No luck this time. Below is a video compilation that I initially put together for the owners to see if they’d heard this noise or had any answers for us. The video contains all of the audio and video mentioned above. Other than one moment where we believe we may have heard this same sound very softly on the third floor of the building (not loud enough to be caught on audio or video), at no other time or location did we hear the “moaning” sound that evening. Just some random thoughts tonight. In an earlier post, I had show-and-tell and shared with you a little of my process of putting together a rough analysis of a paranormal investigation. Well… I added a step and tried something new this time around. And I’m not going to lie… I’m kind of realizing how ridiculous I get sometimes. Sometimes I’m too OCD and detailed for my own good. This took me a few days. Helpful? Yes. But it took a lot of time… and so now I still have to finish up the evidence and final report. I’m not sure I’d be able to finish up an entire investigation, analysis, and report for a location on a time limit. 🙂 I need to hire assistance. Same portion of a rough analysis from my recent post. ...and created 24 pages of this! The new timeline analysis that I’m trying for the first time.